Stories about "Howard Hughes Medical Institute"
The grant from the Howard Hughes Medical Institute will fund the transformation of STEM culture at Bates to fully support all students in the sciences. 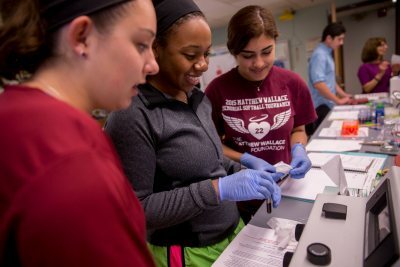 The Howard Hughes Medical Institute announced today that it has awarded Bates College a grant, Bates' fifth from HHMI, for $1.2 million to support science education. The fifth annual Lewiston High School Science Fair takes place from 3-6 p.m Thursday, May 6, in the high school gymnasium, 156 East Ave.
Plaques, medals and more than $1,200 will be awarded for the projects deemed the best at the third annual Lewiston High School Science Fair held Thursday, May 9th. Award-winning students will be presented at the high school's "Night of Excellence" on June 3. The third annual Lewiston High School Science Fair takes place from 3 to 5:30 p.m. Thursday, May 9 in the high school gymnasium, 156 East Ave. Presented in partnership with the Bates College Center for Service-Learning, the fair features nearly 450 projects created during the school year by students in grades 9 through 12. Bates College is looking to Maine teachers and school administrators, as well as the college's own students and faculty, to propose initiatives designed to improve education in mathematics and the sciences. Bates College has received a $1.3 million grant from the Howard Hughes Medical Institute, the nation's largest private supporter of science education from elementary school through postdoctoral studies.